New York - The American Opposition has again taken to the streets in their strongholds to protest the regime of new President Donald J. Trump. Trump, installed by unelected elites using an arcane aspect of the nation’s 230-year-old Constitution after receiving far fewer votes than opposition candidate Hillary Rodham Clinton, has faced mass protests on each of his nine days in office, succeeding opposition party leader Barack Obama. Trump, who ran for the presidency on a platform overtly favoring the majority ethnic and religious groups, has executed near-tyrannical rule over the country since his installation on January 20. Despite the ruling party holding large majorities in many State parliaments and indeed the national parliament, Trump has largely usurped them. 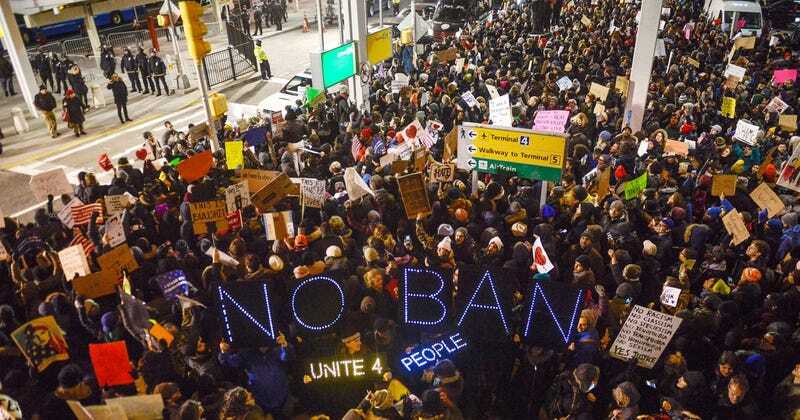 His ban, designed in theory to prevent potential minority terrorists from entering the country, is also preventing legal US citizens and residents from reentering their country. Border Patrol agents are refusing to allow lawyers to speak with those detained, in direct violation of the nation’s Constitution. Even America’s strongest allies have condemned the decision. British Prime Minister Theresa May released a statement, despite being in the United States when the order was signed. Justin Trudeau, the Prime Minister of Canada, the United States’ neighbor to the north, has publicly condemned Trump. Clinton, despite calling for calm in the immediate aftermath of the election, has repeatedly released statements supporting the opposition protests, despite remaining in hiding following Trump’s installation as President. Leaders of the ruling party, including Trump, have repeatedly called for investigations into Clinton and even her imprisonment. Supporters of the opposition have called it a witch hunt. The ruling party claimed power democratically in the 2010 election in many states and the national parliament, and furthered that power in 2014 before the presidential election of 2016. Previous president Barack Obama was a member of the opposition party, and was a staunch supporter of Clinton. Opponents of Trump, whom the opposition labels an ethnic nationalist in favor of the majority ethno-religious group, are not expected to subside with civil unrest. There are calls for a general strike within the next month. Obama was the first president from the minority ethnic group, and was largely opposed by the majority ethnic group in both his elections. His election gave hope for a new multicultural era of understanding between the historically fraught ethnic groups, but instead led to sectarian bickering that devolved the political discourse in the nation. Trump’s supporters overwhelmingly came from the majority ethnic group, as do most of the supporters of his party. He receives a large amount of his support from rural areas and areas without ethnic integration. Clinton’s supporters came from majority-minority areas and urban areas. Trump’s refugee ban has led to criticism from even those in the ruling party, including previous party leader and presidential candidate John McCain and leader of the centrist wing Susan Collins. If he is not removed from office or incapacitated, Trump’s term expires on January 20, 2021.